Dr Stephen DiBartola speaking on the topic of renal diagnostics. This article is sponsored content brought to you by IDEXX. 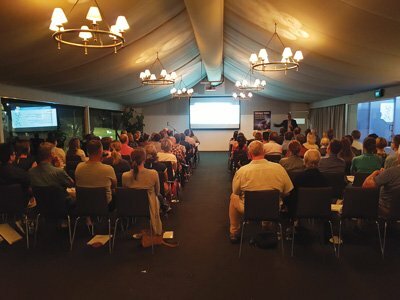 Earlier this year, IDEXX Laboratories hosted Emeritus Professor Dr Stephen DiBartola and his wife Dr Maxey Wellman from The Ohio State University for a memorable educational event. The speaker tour across Australia and New Zealand, titled ‘Making the most of biochemistry: an update on clinical renal and electrolyte parameters’, delivered an insightful presentation on the importance of the modern chemistry panel defined by the inclusion of Symmetric Dimethylarginine (SDMA) and the subtleties of electrolyte changes in the canine and feline patient. Dr DiBartola and Dr Wellman are renowned experts in the veterinary field, with extensive qualifications and achievements. Dr DiBartola is most notable as the author of the definitive textbook on Fluid, Electrolyte and Acid-Base Disorders in Small Animal Practice and was well qualified to speak on the topic of renal diagnostics due to his special interest in renal function and his body of research into reactive amyloidosis and polycystic kidney disease. Dr Stephen DiBartola delivered a speaker tour across Australia and NZ. Dr DiBartola took the audience on a review of the interpretation of electrolytes (sodium, chloride, potassium, and bicarbonate), calcium and phosphorus to help demystify a topic that can be quite challenging in complex cases. He worked through each analyte in terms of the potential causes for results to fall outside of the reference interval and the interdependence of certain electrolyte changes, providing practical advice on the interpretation of the abnormalities. The second half of his presentation focused on renal function and addressed the challenges of assessing glomerular filtration rate in-clinic. He shared with the audience his views on the IDEXX SDMA® test—that for a new test to be accepted, it had to have a clear advantage over current methods. As SDMA is highly correlated with GFR, increases earlier than creatinine and is not affected by changes in lean body mass, it meets the criteria of having clear advantages and therefore should become an accepted methodology for assessing GFR in practice. Dr DiBartola and Dr Wellman were joined during the tour by IDEXX Medical Affairs Veterinarian and Canine Medicine Specialist, Dr Graham Swinney, to deliver more than two hours of professional education. 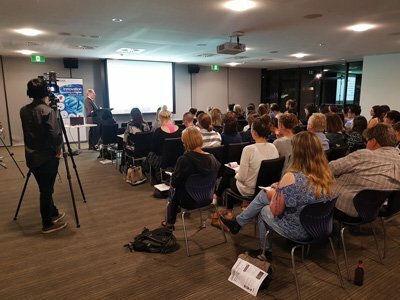 They shared their collective expertise across five locations (Sydney, Brisbane, Melbourne, Adelaide, and Auckland) and spread an important message about the IDEXX SDMA® test and its usefulness as an essential part of the minimum database in a variety of settings. During the tour, IDEXX also announced the arrival of the new Catalyst® SDMA Test, which will enable vets to incorporate SDMA into a timely in-house assessment of kidney health in just 10 minutes.